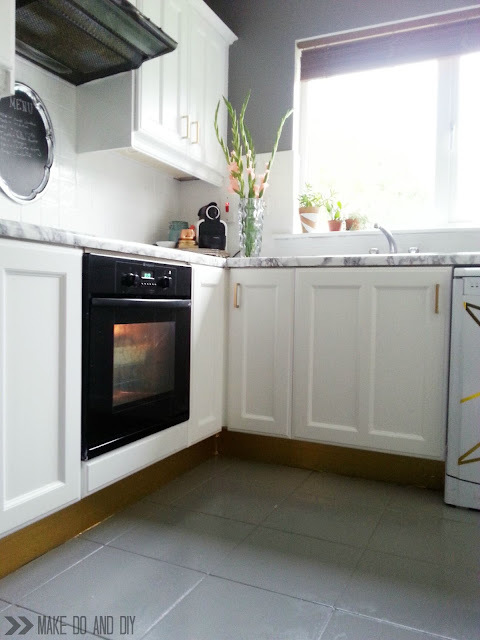 First off, can I just say a HUGE thank you for all the positive feedback for the kitchen reveal? It was so great to hear how much you all liked it. I mean, I knew I liked it but to hear all of your kind comments really drove home to me how right I was to go with my gut and just jump into that makeover....even though people looked at me like I was crazy when I told them what I was doing! So today I'm going to go through the process of painting our kitchen floor....and the pros and cons of taking on a project like this. The 90's called, they want their floor back. 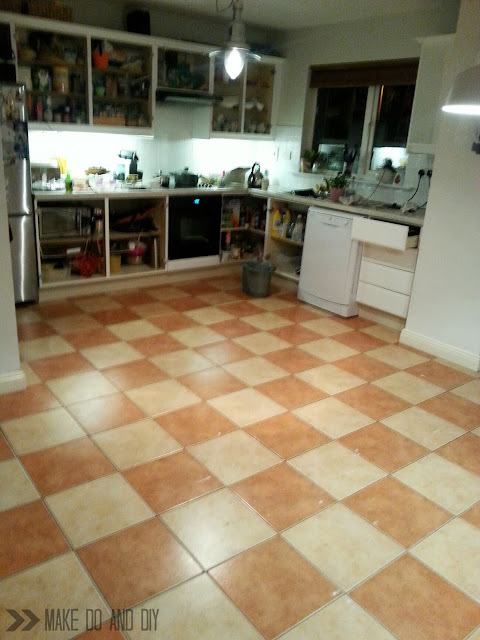 We cut in around the edges and between the tiles first with a brush and then went over it with a roller. This took about 30 minutes with two people working. After the primer had dried we busted out the special paint and repeated the process-edges and between the tile with a brush, then fill in with the roller. 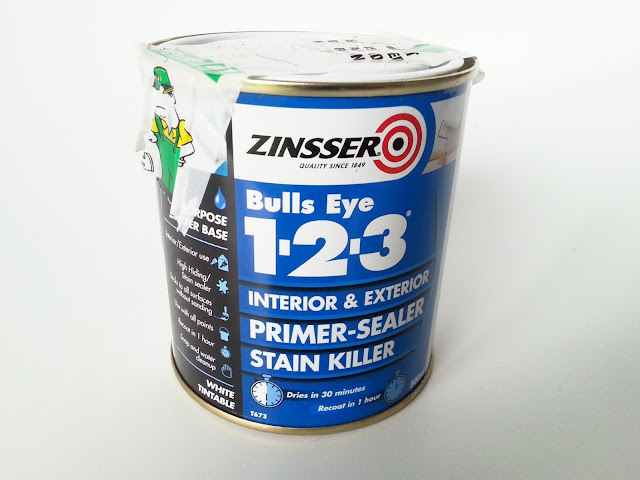 You want to keep the coats quite light in the hopes that this will help the paint adhere properly. 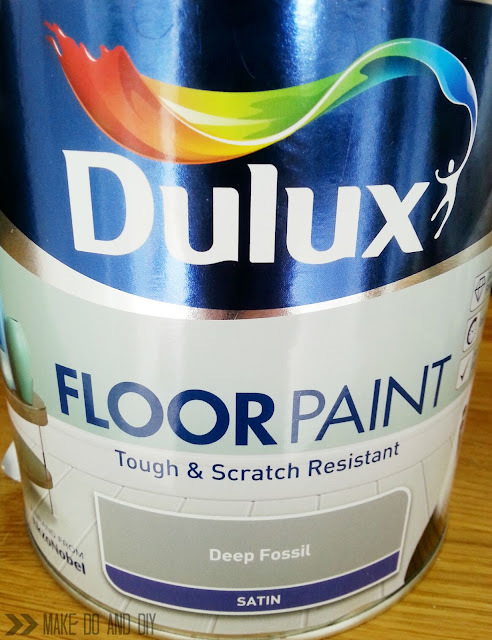 This is the paint I chose, it was €50 for 2.5 liters in Homebase, and this was more than I needed. 1) This was a hell of a lot cheaper than tile paint. 2) The tile paints I could find had really limited colour selections, whereas this was exactly the shade I was looking for. 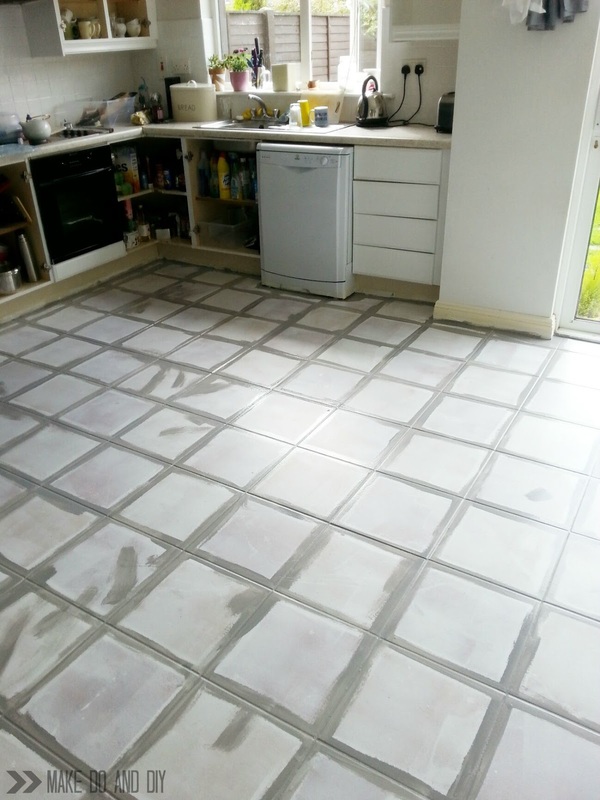 3) To be totally honest getting paint to stick to the tile was the big problem, and seeing as I didn't hold out much hope that any of them would miraculously do this job better than the others (I thought it would be my job to help that with preparation and primer!) i decided that the smartest thing would be to go for the paint that would be the most durable. As "tile paint" seemed to be intended mostly for backsplashes, I thought paint intended for floors would be my best bet for going the distance. We did two coats and called it done. There are spots that would have benefitted from a third coat, but to be totally honest no-one but me would ever notice so it wasn't worth going over it again to me! I let it all dry overnight and then removed the masking tape from the skirting boards. Max wanted to help but his approach was kinda just ripping tape off the wall willy-nilly, so it took some paint with it that I had to go back and touch up (you can just see the evil orange tile peeking through again in the photo above). So, lesson learned, babies are crap at diy. I did the rest alone and ran along the edges with a sharp craft knife first to detach the tape from the paint and prevent it cracking. The can said to let the paint cure for 48 hours before bringing furniture back in, so I gave it 72! When I did bring the furniture back in I made sure I had felt pads under everything, and I brought a rug in for under the dining table, which will be getting a lot of wear with all the moving of chairs. 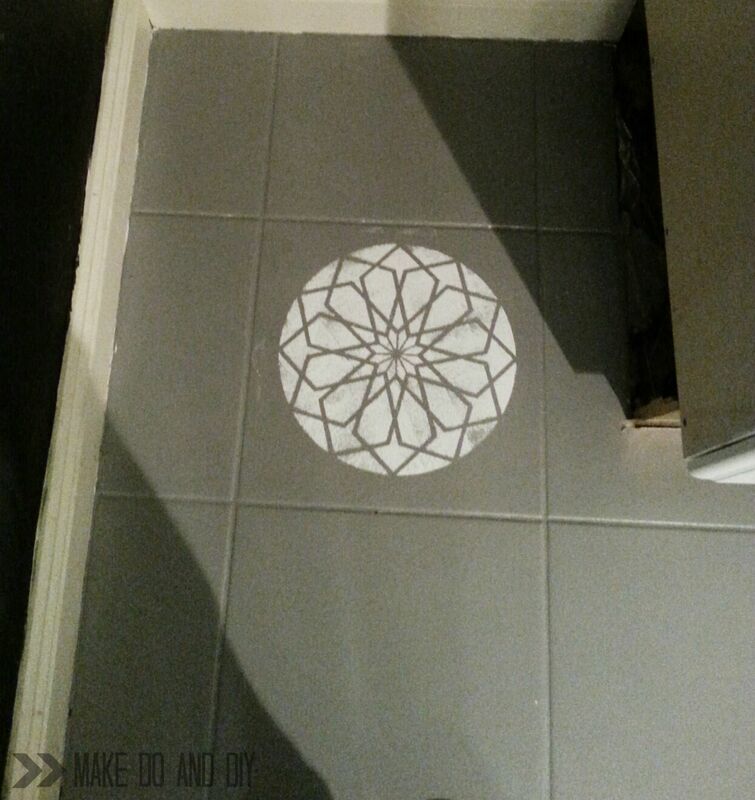 I did at one point consider stenciling a pattern in white over the grey, but when I tried it I didn't like it. This is now hidden under the fridge. So that's how we did it, and it makes a HUGE difference to the look of the kitchen. I love it, truly I do. It makes the whole space seem so much bigger, cleaner, and more modern, and it gives me a neutral canvas that I can change the look of with just a few accessories if I want. Now, for the serious bit. I've shown you that it can be done, but should you do it? Well, that depends on a few factors, the main ones being what your expectations are as far as durability is concerned, and what kind of traffic your kitchen will be dealing with. This catastrophe was the result of a fairly successful three year olds party which was attended by eight hyper kids and fourteen adults, none of which removed their shoes and most of which congregated in this area (it was cocktail sausage adjacent). So I touched it up that night with leftover paint and it's fine now, you wouldn't ever think it was there (it's surprisingly easy to touch up actually, no sign of it afterwards). But the thing is, no matter how well you prep your floor, or how good a job you do with the painting, this is paint on tile, and it's never going to be super durable. Now, I'm perfectly happy spending ten minutes touching it up with an artists brush and my leftover paint every month or so, because I absolutely hated the old floors, and I'm planning on ripping this whole thing out in a year or so anyway, but if I wasn't.....well, that might be different. If say, I had pets that might scratch it, or my original tile wasn't my style, but was fairly neutral, or I needed the floor to last a long time, then this probably wouldn't be a project i would take on. So that's it. I'd love to be able to tell you all that this was an absolutely problem-free solution to an issue a lot of people have, but I really want to be totally honest here. So what do you think? Is this something you would try, or would the upkeep put you off? Talk to me! 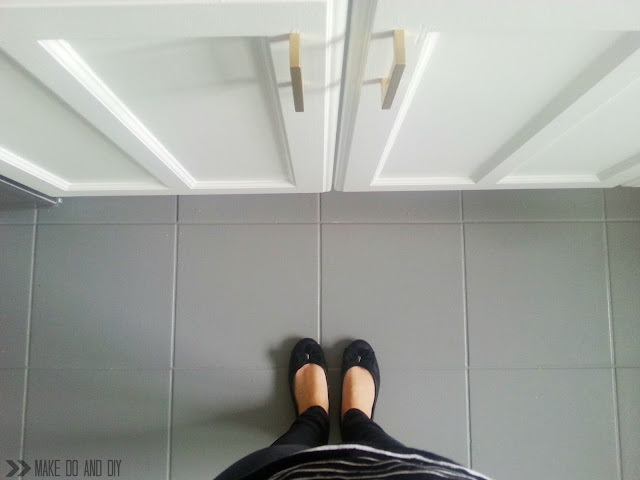 If you would like to see the full kitchen reveal, click here. As for your tiles, I see what you mean. Nothing like other peoples filth to make you want to rip everything out and sterilise your eyeballs! 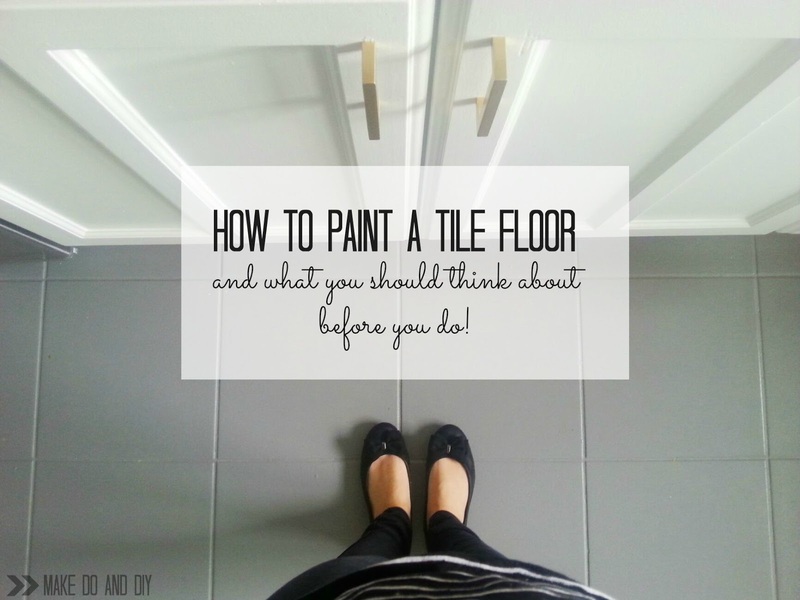 What would you think about just painting the grout though? Those don't look like terrible tiles from here? Also, all my skirting looks EXACTLY like yours did. Makes me want to puke, it's definitely high up on the list of jobs to do! I think about your suggestion every time I look at the grouting on our haggard rental floors. I might do just that and paint the grouting alone as the tiles are in fact fine. And I do like to set myself impossible tasks such as paint all the grout without getting any paint on the tiles! 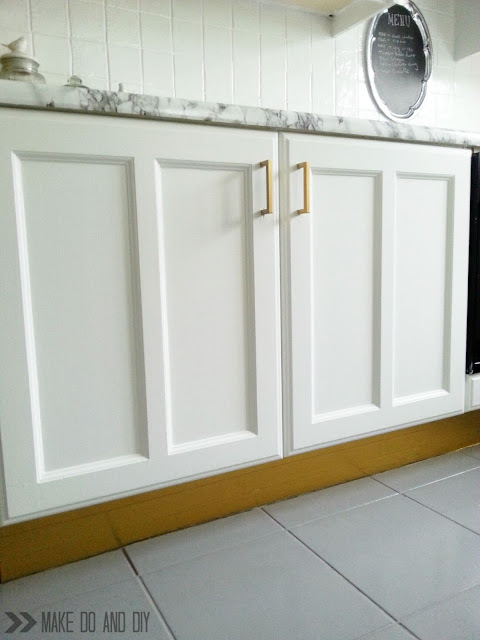 Oh and re: the fugly yellow trim and doors throughout our apartment, I did up a tutorial on how I painted them. It took me about 3 months to do our entire apartment (sans kids, but with 2 very curious cats who kept 'inspecting' everything). I'd recommend using high gloss vs. the more mat finish paint I used. 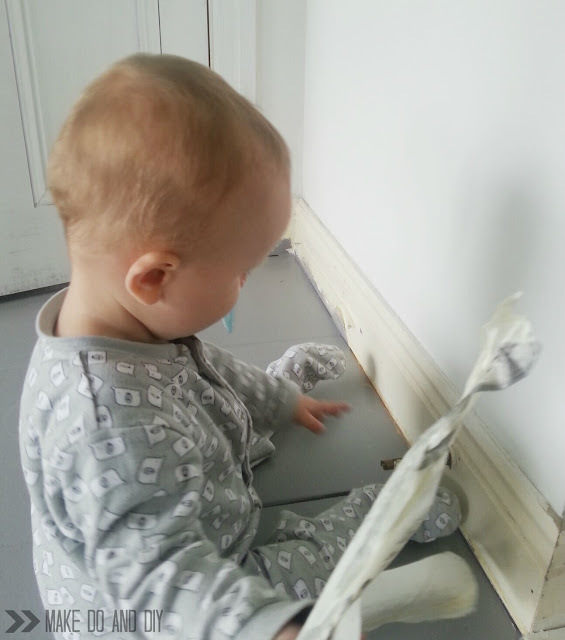 It held up well, but a small few areas of the skirting board have discoloured from daily sweeping. 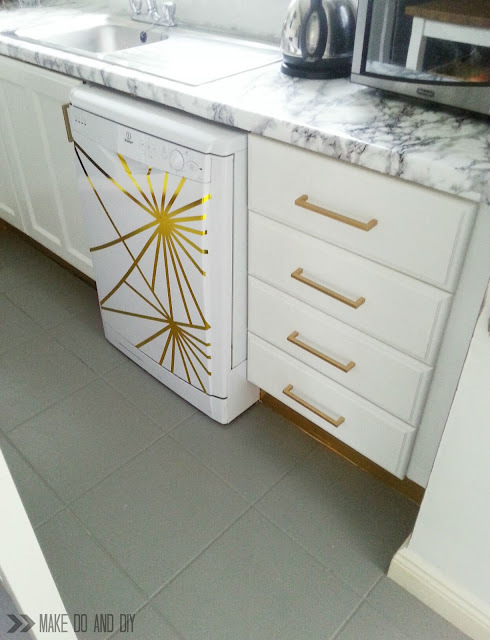 You probably can't get this product here but this tutorial gives you an idea what can be done http://www.livelovediy.com/2012/08/how-to-restore-grout.html I bought a grout renew paint pen in B&Q months ago that I have yet to try but as soon as I do I'll let you know how it goes! Yes, I really must check out your tutorial and get to the trim in here, I just find I'm all gung-ho for the big, impressive parts of a room makeover and then the finishing up totally gets neglected as I move on to another more exciting project! Alex, I am a faithful follower of Retro Renovation by Pam Kuber. Go to her website and search for ROG or cleaners for bathtub or tile. This ROG stuff you can order looks like a miracle cleaner for textured bathtub bottoms and grout. I don't have a need for it now so I haven't used it. 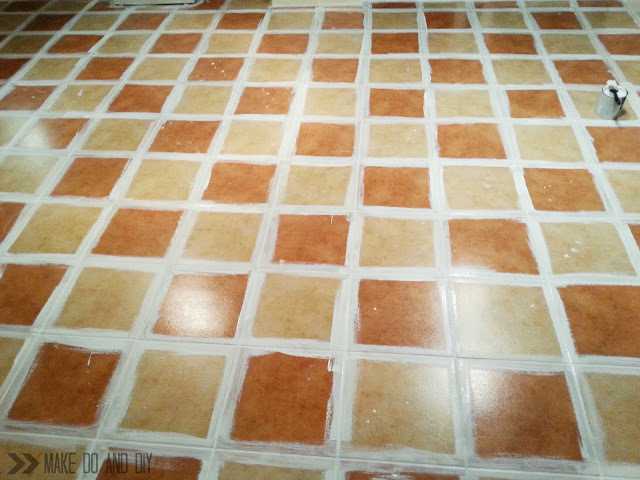 It cleaned some really "crusty" floor grout in a 60's bathroom and the grout looked BRAND NEW! Good Luck. Did you do any clear coat to protect it? I have read elsewhere about applying polyurethane in 2-3 coats to protect, so I was wondering since I didn't see that written in as a step. For someone wanting a little longer term fix, that might be a solution. I USED A PRODUCT CALLED "Varothane" on my painted floor and it has bed amazing. I EVEN STEAM CLEAN IT. We have a beautiful patio surrounded by master bedroom, dining room and kitchen on three sides. But white tile! White...and dirty grout. I was thinking of painting a darker color but didn't find this blog in time. I might do it in the future and with poly to protect. 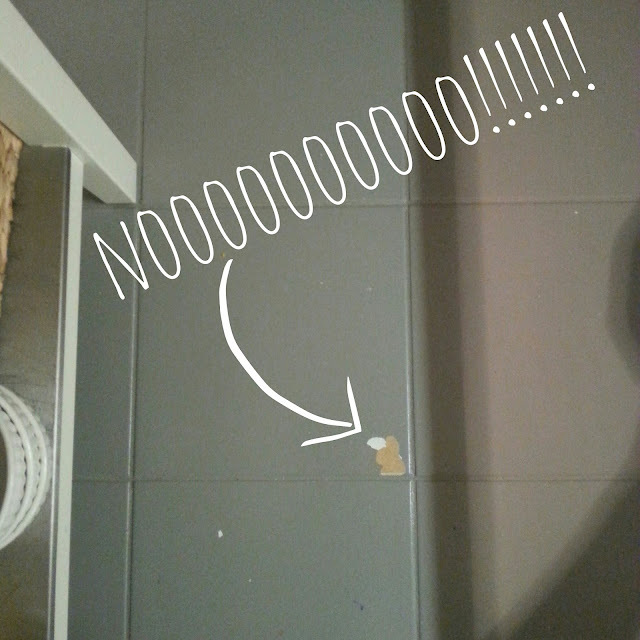 I did start cleaning grout in the house with Clorox Toilet bowl cleaner, then resealing. Well, you know how one thing leads to another....I opened the door and started the patio. I didn't do the deep cleaning...just cleaned. I decided to try the Renew Grout paint/resealer in tan. I had the color from the bathrooms. Maybe not the right color but darker to hide more dirt. 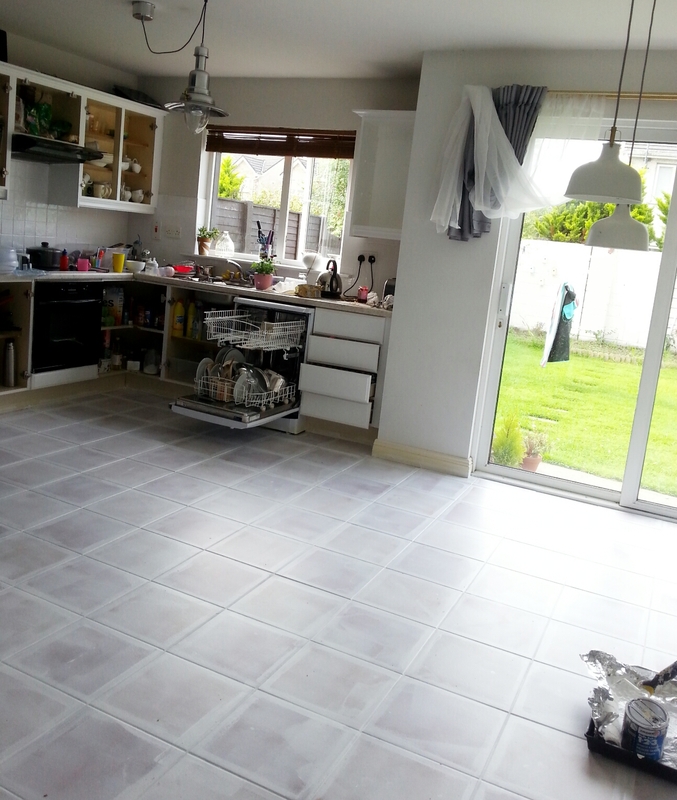 As I am barely half way through �� I would have saved lots of time by just painting the whole thing, grout and tile. I see too much dirt on the white tile. If I can find a "marbley" effect to hide the dirt.....I know there is the stone look for counters. I am now sold on painting though. There are only two of us. No stilettos. It is covered from direct elements...but still Ill have to be careful not to make it slippery when wet. Maybe next year I'll have researched. Thanks so much for sharing your adventure! You are brave!!! But it worked! Isn't it great when you try something and it turns out great? Oh man I am so guilty of doing that, ending up doing lots of smaller "fixes" to try and make something better and just wishing I had done the bigger job in the first place and had done with it! 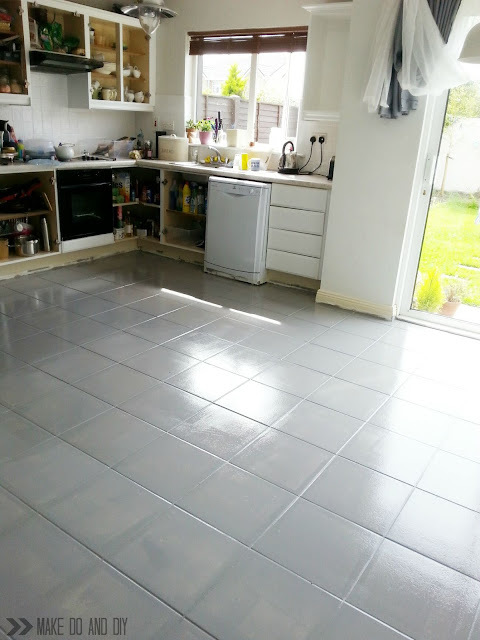 We don't have poly here, just varnish, and anyway I didn't want a shiny finish so it wasn't an option, but I really love the floor and it makes such a HUGE difference in the kitchen that I would do it again in a heartbeat. Good luck with your own floor! LOVE!! Did you ever get around to painting the utility with oil based paint? Thanks Amanda! No, I haven't gotten around to that yet, I'm in the middle of making over my hall and ensuite bathroom, but the utility is definitely in my sights once I'm finished those! Thank you - an informative article with a touch of humour. I should take some 'before' and 'after' shots of my experiment. I have white tiles with and blue corner dot in my Air BnB garden flat. 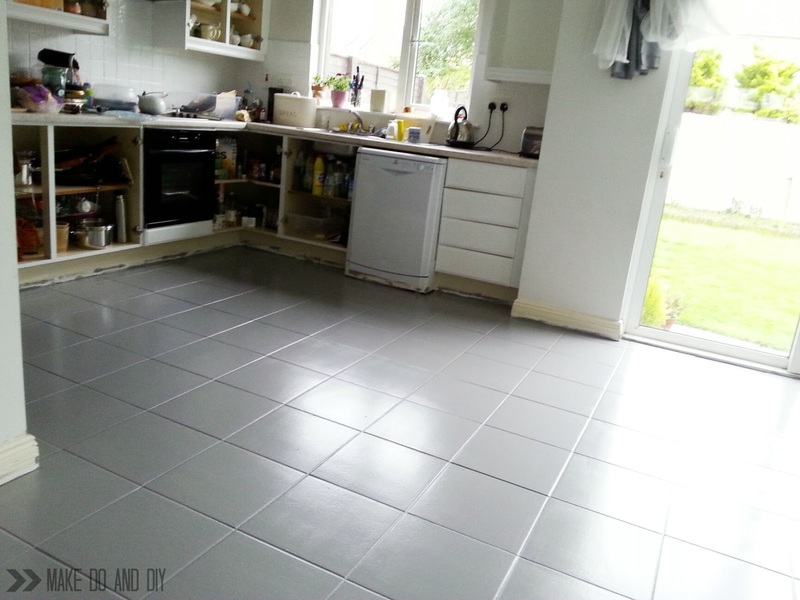 The tiles are mopped nearly daily but they show every speck of dirt and hair - so I simply want a darker colour so its not such a stress every time I clean them to get them spotless - literally : ) I was curious how the group looks when painted and it's not as bad as I thought. I also though I will go for a textured floor paint to provide a bit of grip as the tiles are in the kitchen, bathroom and toilet area - and it does get a bit wet and slippery. This looks absolutely amazing! So sad about not being able to get the poly topcoats there though, can you not order the stuff online? I have used a product called Minwax Polycrylic on my bath counters after painting them. It's great stuff, and very durable. Again, your floor and counters look AMAZING! How do you clean your painted tiles floors? Hi Ericka, I clean them the exact same as any other floor, I usually brush cos I find it more effective but I sometimes use the vacuum on it too,and I mop it with the usual floor cleaner. The one thing I would say is you can't leave a bucket of hot water for mopping sitting on it, as I did end up with a peeling patch once because of that! Thanks for your post on this. I'm planning on repainting my restaurant floor tiles as they are old and mottled and the idea of trying to get my landlord to agree to ripping the tiles up makes me sicker than the tiles themselves! I'll send you some pics when I'm done. Just awesome and most effective.i want to know that from you,how this is possible.i am trying to clean my floor but i can not clean like your floor.i use mop but i have no idea another tips.so please sugesion me about this. Did you scuff the floor first? I’m really appreciate thanks for your sharing !!!!! The wood varnish you used to seal the the floor will protect the paint from my bathroom floor even if its constantly getting wet ? That's the plan. 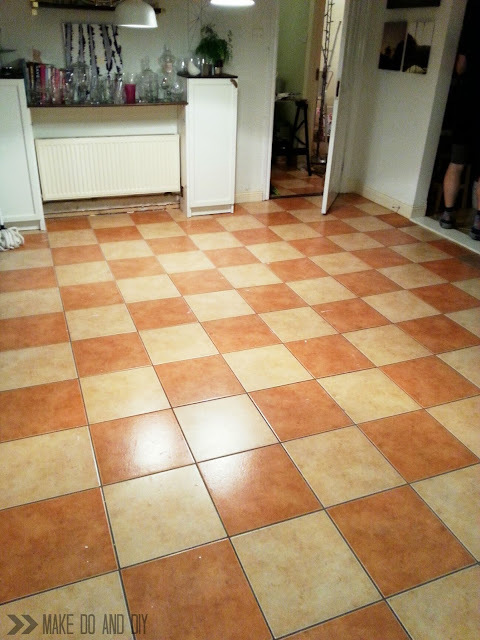 I painted my kitchen floor and didn't put varnish over it and I was pretty happy with the result so I'm pretty confident in this. It's been a couple of months now and there's not a mark on it. Plus, I'm always in the habit of putting down a towel on the floor when we shower so it never really gets all that wet. would the paint you buy for garage floors be more durable? Possibly, I don't have any experience with it, but this paint was floor paint so it should be durable. Just wanted to say I'm super happy to have found this post!! I found the comments helpfull too. I'll try using white tile paint and add some colourant to it to get the grey. As I'm painting wall tiles anyway I'll do a little test too to check if it comes off easily. I've got you pinned on my Pinterest so I'll be sure to come back and update you when I do. Thanks for the great post and ciao for now! I am thinking about doing this in a entry way, as of now I have dark green high gloss tile. I have 3 small children so that means I have toys being drug around all the time, but do not want to spend the money to replace it. Any suggestions would be great. I think in an entryway, and with kids playing....it isn't really going to hold up all that well. If it were me I'd buy some linoleum in a funky pattern and just lay it on top after cutting to size. Not a "forever" solution, but will absolutely work until you can change the tiles.